This is the final book in the Inheritance trilogy, set about a century after the first. The narrator is Sieh, the trickster god of childhood who was a main character in The Hundred Thousand Kingdoms. He meets twins Shahar and Dekarta Arameri, descendants of his former captors, when they are just children. Sieh plays games with them, demonstrating both the playfulness of a child and the danger of a god with a grudge. The three forge an explosive bond of friendship and Sieh finds himself trapped in mortal form with little access to his magic. He is forced to grudgingly find a place for himself in the mortal world while his godly parents try to find a way to cure him. I really enjoyed this book, it got into my head in quite a strong way. 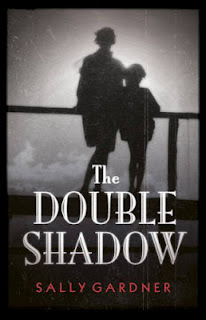 Now that I come to write this I find my recollections have gone a bit vague, but that is almost certainly due to the fact that I read it while I was ill and shouldn't be taken as a failing with the book itself. I remember being impressed at the expanded view of the universe, which had a lot more about the godsrealm and the unknowable Maelstrom. I also liked the way you could tell that society had moved on in the decades since the last book. The main thing I liked was the characterisation of Sieh. 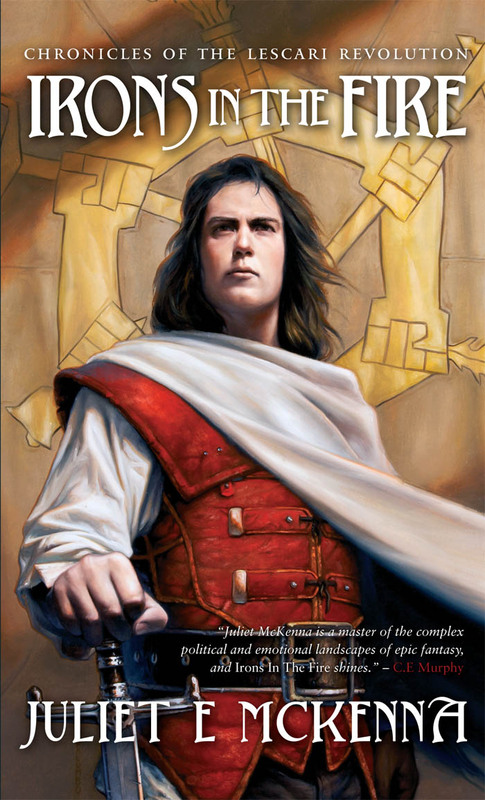 He was one of the most enjoyable characters in the first book, and being inside his head only made him more successful as a character. The format is the same as the previous two books the choice of narrator is a significant change. The first two books were narrated by (mostly) human women, whereas Sieh male and the oldest godling (a god who isn't one of the Three creator-deities), even though he normally takes the form of a child. It is interesting to have a narrator who is a god and sees mortals and their world from a very different viewpoint. Sieh gives us the reader more information about the wider universe and the gods. Sieh is an interesting mix of holy and irreverent, behaving both a stroppy, mischievous child and a powerful god, even though he spends most of the book adapting to no longer really being either. The central plot is about Sieh adapting to his unwelcome mortality, and his relationship with sister and brother, Shahar and Dekarta. There is also a mystery plot about a new type of magic and a rogue godling, but though that becomes incredibly important right at the end of the book I didn't feel it had as much impact as the more personal sections of the story. The relationships between Sieh and the twins are complex and interesting. His initial romance with Shahar is an impetuous, adolescent one. Though the feelings are genuine the situation is tinged with deceit as Shahar fulfills her role as her mother's pawn. Sieh's later relationship with Dekarta (the extraneous, misplaced spare to Shahar's heir) is more open, if sometimes a little obsessive. There's a sense of grand scale that increases towards the end of the book. The Three (the first and most powerful gods) set aside their millennia-long quarrels to try their eldest child. An apocalyptic turn of events matches Sieh's own experience of mortality as he prematurely ages and faces the death. I know I was on Book 2 of the Tales of Einarinn series, and I intend to finish it, but the waiting list at the library means that Book 3 is not available yet. On the other hand I got my boss to buy Chronicles of the Lescari Revolution (as there weren't any copies in the city), so this trilogy is right there on the shelf at work. Lescar has seen centuries of civil war as generations of dukes use mercenaries and militias to fight among over the title of High King. While there is great distrust and even hatred among the six dukedoms, outsiders see only a mess to be ignored or exploited. Those who escape the country find there is little pride in being Lescari and can do little more than send money home to their beleagured families. Until a group of idealistic rebels, exiles, merchants and scholars join forces with skilled mercenaries and a powerful information broker to try and bring an end to the strife once and for all. As someone with an interest in history this sort of story is very much up my street. Being set in a secondary world means there's no need to get bogged down in real world details (though I do like well-done primary world historical fantasies too), which are sure to be somehow controversial. * That said I know the author has a good grounding in history, and so the events in the story will be realistic and plausible within the early-modern-style setting, allowing me to happily get on with reading knowing I'm in good hands. The cast of characters grows with the revolution, which starts as a hopeful, academic exercise and grows into a full conspiracy. The first set of characters, Tathrin and Aremil, are idealistic scholars, bound by the desire to do the best for their homeland. Then more worldly characters are brought in; rabble-rouser Reniack, information-broker Charoleia & mercenary brothers Sorgrad and Gren. These worldly characters change the plan to something more workable, though it requires greater sacrifices from all involved. We also see through the eyes of Litasse, a young Lescari Duchess, who knows only the privileged competitive viewpoint of the warring nobility. Failla, a young woman with a lot of secrets, is recruited to the cause, but only dreams of escaping. All the characters have their strengths and their flaws, be they physical or moral. There are a lot of people to keep track of but the plot never become muddled and the book doesn't feel crowded. The conspiracy grows as merchants and mercenaries get into position, providing resources and manpower. Being a fantasy story magic has it's part to play, the tricky matter of communication over distances is solved by use of recently rediscovered Aetheric magic. This mental magic is not flashy, but it certainly is useful, allowing the conspirators to respond to changes as and when they happen. This is very clearly a first novel. The players are introduced and the stage is set. There is plenty of action throughout, and the progress made means the pace never feels slow as the reader is kept abreast of all the important developments. The early stages of the revolution (not that it is yet called that) happen, but it is clear that there will be great difficulties ahead. I finished this book wanted to read more, and I'm glad that the next books are easily available to me. * The more you learn about history the more you see how full of uncertainties it is. Also historians like a good argument, so there are few historical "facts" that some historian, somewhere won't argue with. If you don't believe me try googling the phantom time hypothesis. I'm very happy to announce that I've had another story published online. Gloom Lord's Captive was published by The WiFiles this week. Marsha is kidnapped by an amateur supervillain. How will she escape? I wanted to write a story about a woman who's in one of those traditional female-character situations and manages to sort it out for herself. I'd mostly forgotten about it for years after I left school, but actually I'm not too bad at it. As with many things I suffer a bit from not being a naturally neat person, but that means I'm also pretty handy with an unpicker. I'm out of practice, but I reckon I could probably still make an entire garment - thought it might be a slightly wobbly one. That said, I can't actually machine sew at the moment as my sewing machine keeps ingesting the thread. If you look towards the top right of the page you'll see a blue moose. I made him a few years ago for my husband's birthday (a kind friend did the scarf as I'm not a kintter). He's adapted from an ornament pattern I bought online (there are not many fabric patterns for moose, let me tell you) and was made using a combination of machine and hand sewing, with advice from my mother. They are my interpretation of designs from Zombie Felties by Nicola Tedman and Sarah Skeate. I got the book from work initially, then my lovely husband bought me my very own copy for Christmas. 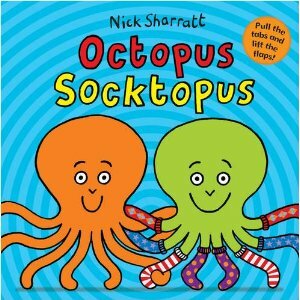 I also made a Socktopus for a colleague's birthday. 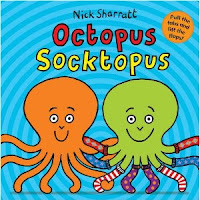 It is inspired by Nick Sharratt's book Octopus Socktopus. 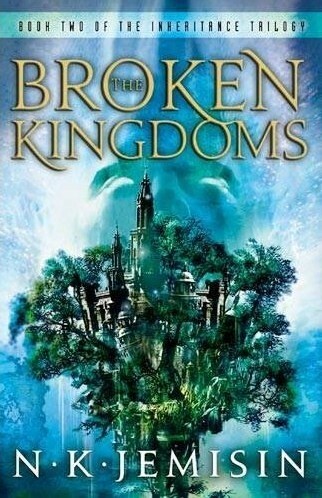 This sequel to The Hundred Thousand Kingdoms is set ten years later. I'll try to avoid major plot spoilers for the first book. Oree Shoth is a blind artist who can see magic. She left her home country and lives in the city of Shadow, where the streets are vibrant with magic because of all the godlings (lesser gods) that live there. Oree charitably takes in a silent man she finds on the street, her new lodger seems to be totally mortal but he resurrects whenever he dies -something that happens quite often as he doesn't take any care. After Oree discovers the body of a murdered godling she must abandon the independent life she has crafted for herself to fins sanctuary with her former lover. 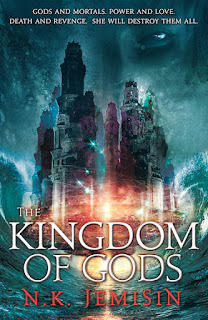 She is kidnapped and dragged into a conspiracy against the powerful ruling family and the gods themselves. Where The Hundred Thousand Kingdoms was all about the machinations of the world's ruling family and the three most powerful gods, Broken Kingdoms is set at street level. Oree is blind and scrapes a living in the city underneath the World Tree (which was created at the end of the last book) and has mundane concerns like rent, food, and whether she should contact her ex-lover. The city of Shadow is physically underneath the palace featured in the first book. The bustling urban setting is very different to the luxurious palace of the ruling Arameri family. It's cosmopolitan and full of people from all over the world, many of them pilgrims. 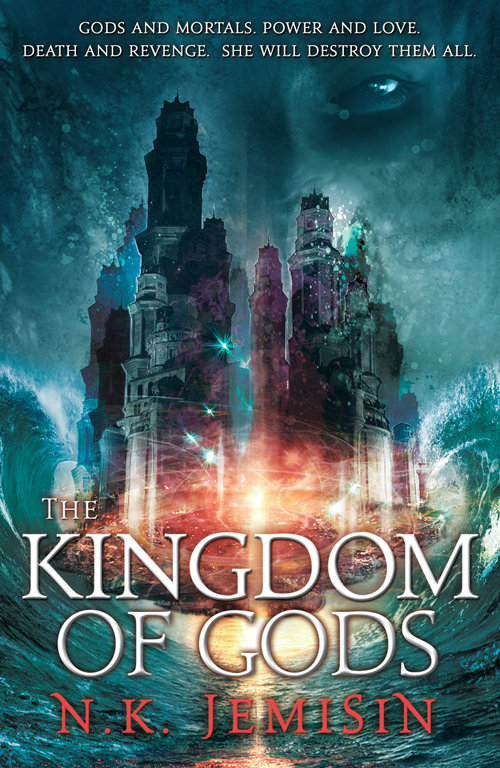 Since the previous book the godlings have once again entered the mortal realm again, but they're only allowed live in Shadow for fear that they will create chaos in the wider world. Oree's lover Madding is also a godling, and he provides insight into relations between mortals and godlings in this new world. Despite her low social status Oree is not an ordinary protagonist, her sense of independence is very strong and she values her life as she has to work so hard for it. N. K. Jemisin has skillfully written a book from the point of view of a blind character, so most of what Oree witnesses is told through sound, movement, feel and smell. It doesn't detract from the description and adds a layer of interest to the plot and characterisation. As Oree can only 'see' magic any visuals mentioned are likely to be significant and vibrant and have a greater impact on the descriptions than they normally might. The plot starts with Oree pulled into a murder investigation, then she is faced with increasing levels of danger as she discovers more about the secret history of the gods. She is kidnapped by a dangerous group of fanatics who seek to use her as a weapon, and she must find out more about her unusual powers and her family background. It's clear that there is more to Oree than she suspects, the mystery of her origin and the lunacy she has been pulled into really kept me reading. The implications of the plot are not as wide ranging as the first book, but plant the seeds for greater change to the world in the next volume. Amaryllis Reuben does not act as a proper young lady should. When she is expelled from boarding school after running off for a night in London her father is at his wits end. Arnold Reuben, a very rich man obsessed with memories and the past, doesn't understand the woman his daughter is becoming and misses the affectionate little girl she used to be. Amaryllis is forced to spend her time with Ezra, the cook's son, and despite initial antagonism between them they become close. Events take a turn for the disastrous as Arnold Reuben's plans for his daughter go awry on her seventeenth birthday and several people from the house and estate disappear. As the Second World War changes everyone's lives and Ezra gets involved in a rescue mission to recover those who disappeared. This young adult book is a fascinating read, combining a historical setting with strange, science fictional elements. There is a fairly large cast of characters, both adults and young people, most of whom live on or near the Warlock Hall estate owned by Arnold Reuben. As memories are a major part of the plot the characters are often described through flashbacks to their younger days, or else their attitudes towards the past. Arnold Reuben is both driven by his desire to live in the past, whereas shell-shocked solider Mr Pascoe is trapped by hallucinations of his hellish time at the Front. Main character Amaryllis initially appears to be a bit of a spoiled brat, but though she acts badly towards other characters it's clear that she's starved for affection. Ezra is much more likeable, a cook's son who is keen to learn and becomes a dedicated and brave agent in the Second World War. There are various strong themes and images that repeat across the plot and the years in the book, tying parts of the story together and sometimes linking generations. The white tiger is an animal and an image that reoccurs regularly in different places. There's a character called Tommy who has a mouse that he carries around with him, I found this adorable as I personally think mice are very cute. It turns out that the mouse was a present from his father who also liked mice. Cinema (meaning both the films themselves and the building where people go to watch them) is very important to the book. Much of the plot revolves around the mysterious picture palace that Arnold Reuben has invented and the memory recordings he and his assistant Silas take. There were a few bits that made me think of Life on Mars by David Bowie, especially the first verse, though that association may only occur to me. 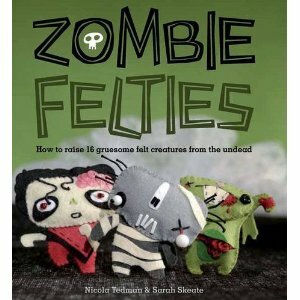 I intend to recommend this book to the members of the teenage reading group at work.